Superbook’s Pilot Episode Garners High Ratings! In my other blog, The Lifestyle Avenue, I blogged about Superbook’s Super Launch for their pilot episode (Read more here: http://thelifestyleavenue.com/superbook-super-launch/) on GMA last week. And I just want to share the good news, Superbook’s Pilot Episode garnered high ratings! Congratulations to the team of Superbook, you deserve it! It’s proven and the numbers say it all! Superbook’s television come-back last June 1 was well received by Pinoys, young and old alike, as it took the 15th spot on the Overnight Data of the National Urban Top Daytime Programs list provided by Nielsen Audience Measurement. Many Filipino families from different parts of the Philippines woke up early and watched Superbook Reimagined’s pilot episode entitled “In The Beginning.” According to Nielsen,Superbook Reimagined got a 2.9% of the individuals watching during its 7:30am-8:00am timeslot, which earned it a spot on the top 15 tally. The ranking was based on all daytime TV programs between 6:00am and 6:00pm that aired last Saturday and the audience covers those living within the national urban areas. With all the support, positive feedbacks and high ratings, kids and their parents can expect more fun, excitement and learnings from Superbook Reimagined. 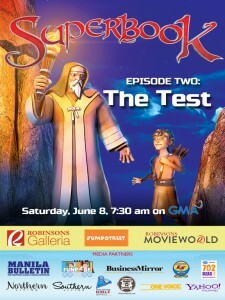 Catch Superbook Reimagined’s second episode entitled “The Test” on June 8, Saturday,7:30 am on GMA. To get the latest updates and news, visit and “LIKE” Superbook’s official Facebook fan page at www.faceboook.com/BatangSuperbook and it’s official website at www.batangsuperbook.com. You can also follow us on Twitter at @BatangSuperbook. FREEDOM ROCKS! Join The Club and Tanya Markova FREE! !